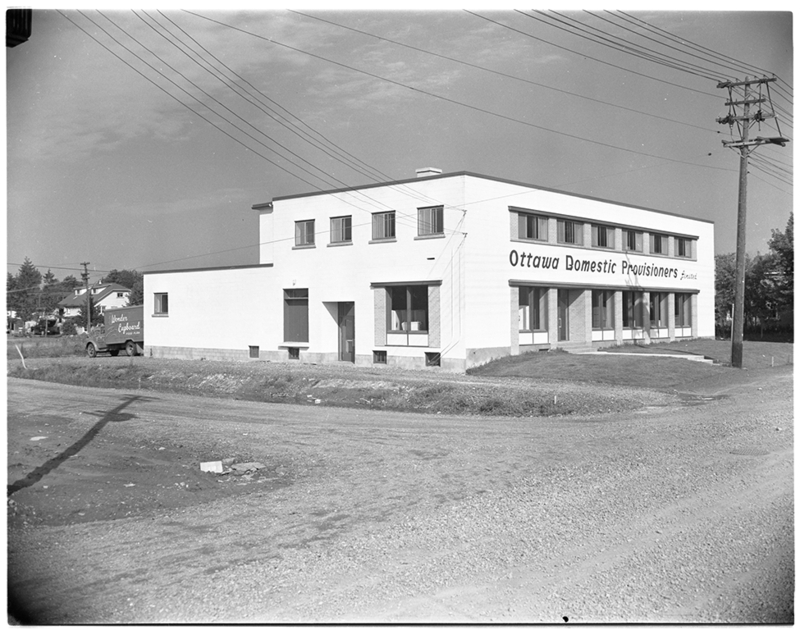 Ottawa Domestic Provisioners’ new facilities at 830 Campbell Avenue in 1956. Source: City of Ottawa Archives CA040033. A few weeks ago, when I wrote about Bertram Witt and his numerous apartment buildings, I briefly discussed his brother-in-law Doug O’Connell’s purchase of the lot at 222 MacLaren. The former home of merchant Ralph McMorran was, just before the construction of the Warren Arms apartments, being used by George Murray as the headquarters of his grocery order business, Ottawa Domestic Provisioners and its Magic Cupboard service. Company display at the Ottawa Home Show, April 14, 1955. Image: City of Ottawa Archives CA-32095. The company trucks. October 3, 1955. Image: City of Ottawa Archives CA34567. The Magic Cupboard – “A miniature supermarket right in your own home!” – was an overnight success. From its humble roots in 1954, Murray’s service quickly grew to more than 7,000 subscribers, growing out of the modest rented freezer space on Boteler street in Lowertown. To that end, Burgess and McLean were hired to design a brand new headquarters and production facility located in the industrial area south of Carling avenue near the Clark Dairy. The Queensway, when completed, would allow Murray’s fleet of trucks to quickly deliver the freezer orders to busy Ottawa families. The public was invited to a grand opening celebration December 7th and 8th. The navigation reference? Webbs Motel.1Ottawa Journal, December 6, 1956, pp. 30-1. Ottawa Domestic (Food) Provisioners’ (Service’s) grand opening was held over two days. Know where Webb’s is? You can get there. Source: Ottawa Journal, December 6, 1956, p. 30. As Ottawa’s suburbs grew, so did Murray’s customer base. Boasts about 7,000 happy households soon became 40,000 households and service was expanded to cities across Eastern and Northern Ontario, including Kingston, Pembroke, North Bay, and Sudbury.2Ottawa Journal, September 4, 1964, p. 52; Ottawa Journal, June 19, 1965, p. 62. All good things come to an end, and by 1972 Murray’s freezer order business was no more. The space was taken over by Frank’s Mobile Canteen owner Vic Jones who rechristened this business as Capital Food Services, an event caterer, cafeteria operator and restaurant supplier. One client was Bob Campeau’s Skyline Hotel.3Ottawa Journal, April 7, 1973, p. 17; Ottawa Journal, February 14, 1975, p. 66. The catering turned out to be a strong avenue of growth for the company and it purchased Morrison-Lamothe’s Social Catering Service in 1976.4Ottawa Journal, May 22, 1976, p. 15. 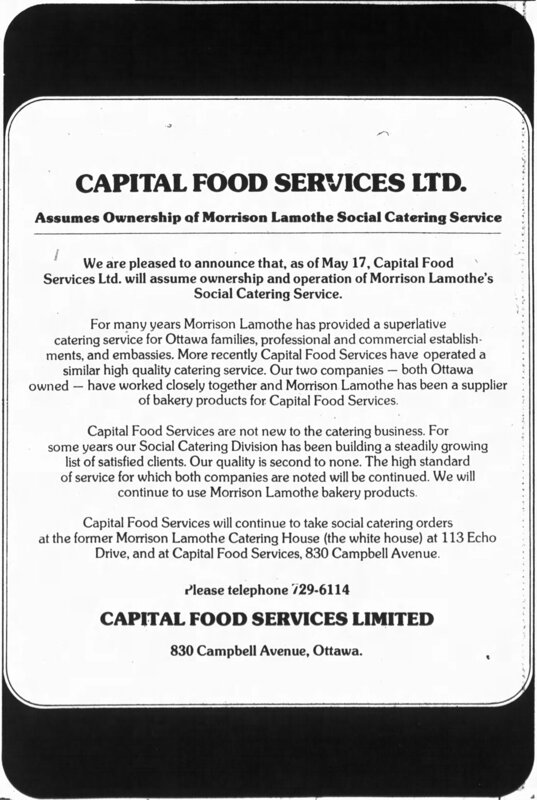 Capital Food Service: the new owner of Morrison-Lamothe’s Social Catering Service. Source: Ottawa Journal, May 22, 1976, p. 15. In 1987, Capital Food Services was acquired by Scott’s Hospitality, which was perhaps best known for its ownership and operation of the numerous KFC franchises, Holiday Inns, and other brands across Canada.5Karen Benzing. “Scott’s Hospitality clinches takeover of Capital Food,” Ottawa Citizen, March 4, 1987, p. C9. 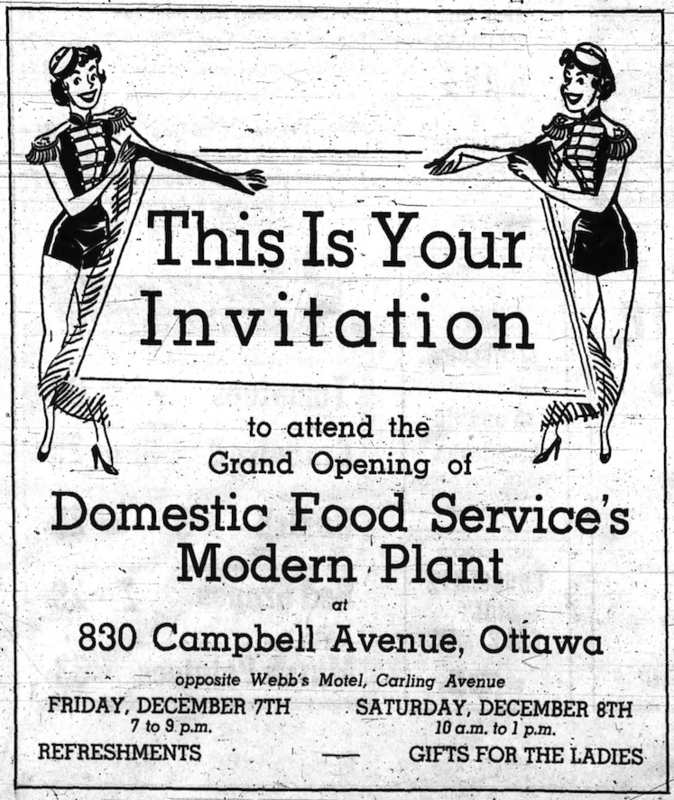 Six years later, the catering and restaurant/cafeteria business part of Scott’s portfolio was sold to Beaver Foods, which had quietly cornered the market in university and college cafeterias.6For his own part, former Capital Food Service owner Vic Jones had gone on to found the Ottawa-Carleton Food Services in the same field. See “Firm independent of ‘puppet strings’,” Ottawa Citizen, August 3, 2000, p. B3. Beaver Foods was subsequently acquired by Cara Operations, which is best known for its ownership of restaurant chains such as Harvey’s, Swiss Chalet, Kelsey’s, Montana’s, and others. All familiar sights in suburban power centres across the country. Cara Operations, in turn, sold Beaver Foods to the British-based Granada Compass PLC,7Terry Weber. “Cara to sell Beaver Foods assets to British firm,” The Globe and Mail, November 3, 2000; “British Firm buys Beaver Foods for $150 million,” Ottawa Business Journal, November 3, 2000. which still maintains an office at 830 Campbell. It shares the building with MCL Hospitality, a restaurant equipment rental business. The building in May of 2016. Though functional, there’s something a little less special about corrugated steel cladding. Image: Google Maps. 1. ↥ Ottawa Journal, December 6, 1956, pp. 30-1. 2. ↥ Ottawa Journal, September 4, 1964, p. 52; Ottawa Journal, June 19, 1965, p. 62. 3. ↥ Ottawa Journal, April 7, 1973, p. 17; Ottawa Journal, February 14, 1975, p. 66. 4. ↥ Ottawa Journal, May 22, 1976, p. 15. 5. ↥ Karen Benzing. “Scott’s Hospitality clinches takeover of Capital Food,” Ottawa Citizen, March 4, 1987, p. C9. 6. ↥ For his own part, former Capital Food Service owner Vic Jones had gone on to found the Ottawa-Carleton Food Services in the same field. See “Firm independent of ‘puppet strings’,” Ottawa Citizen, August 3, 2000, p. B3. 7. ↥ Terry Weber. “Cara to sell Beaver Foods assets to British firm,” The Globe and Mail, November 3, 2000; “British Firm buys Beaver Foods for $150 million,” Ottawa Business Journal, November 3, 2000.